From the wedding venue to the lighting, there are so many details of an outdoor wedding that a couple can control. Unfortunately, no one can plan the perfect wedding weather (no matter what the date! ), making a wedding tent rental a ‘must’ of every outdoor wedding. Before going through the list and planning a memorable outdoor wedding, couples shouldn’t forget about those “boring” and important aspects of a wedding tent rental. Every couple should ask their wedding venue if a wedding tent is allowed, where it is allowed, and if there are any restrictions or permits that need to be secured. (Make sure these details are communicated to the tent rental company or that a connection is made between the venue and rental company.) Once all of those details are taken care of, it’s time to start envisioning all those wedding tent decorations coordinated into a stunning wedding day. An outdoor or backyard wedding is a beautiful idea with a long wedding rental checklist. In addition to the “normal” tasks on an indoor wedding planning checklist, an outdoor wedding requires quite a few wedding rental items. The tent (for when our Chicago weather gets too hot, cold, or rainy), the chairs, the tables…all these big outdoor rentals are part of a wonderful wedding atmosphere—PLUS some smaller items (like table linens and cooling) that shouldn’t be overlooked. Permits. Some venues or areas require permits for hosting events, putting up structures (like tents), and even using propane tanks. Even backyard weddings may require some paperwork. An experienced party rental company should be able to answer questions about permits, especially at common outdoor wedding sites in Chicagoland. Electricity/utilities. Many of the elements of an outdoor wedding need a power source. Some items may require more heavy-duty connections; discuss power requirements with the wedding venue and party rental company to keep the lights on and the music going. Volume limitations or regulations. In some areas, volume limitations, regulations, and curfews are in effect. Ask Chicago wedding venues about any volume limitations or curfews during the venue tour. For a backyard wedding, contact local municipal offices for specific information. Staffing and vendors. For a smooth wedding planning experience, choose wedding vendors (i.e. photographers, musicians, caterers, wedding rental companies, etc.) carefully. Prepare a list of questions to ask that ensures they are reputable and professional. This can include questions about their experience, availability, cost, and contract fine print. To avoid an endless search and multiple contracts, contact an experienced Chicago outdoor wedding rental companies that can provide as many items from the wedding rental item checklist as possible. Think of a heated party tent as an extra layer of insurance. 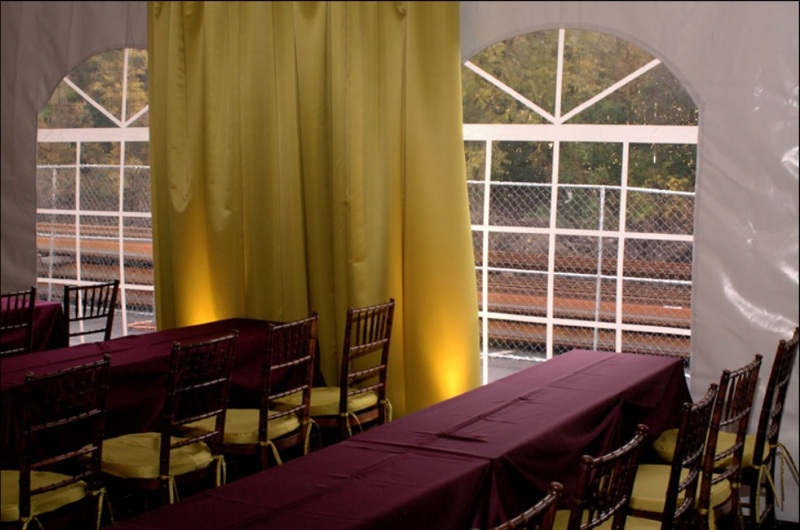 A heated tent ensures that the event can go on—even when it’s cold or rainy. It can also go on comfortably (no matter what the weather), if the following considerations are factored in during event planning. Guests should expect to feel cozy in a heated tent without feeling crowded. The first step of a heated tent rental is to determine what size of tent is needed and the location of the event. Tent rental companies need an estimated guest count to connect the planner with the right-sized tent. The location of the event tent does need to be more exact than the guest count. Before renting, determine the size of the area for the tent, if there is space around the tent for stakes, and whether the surface is hard or suitable for stakes. Proper installation hinges on proper support (with or without stakes). This criterion also plays a part in the total cost of the heated tent rental. Once both criteria are set, contact a local Chicago tent rental company for a quote. A heated tent is a must for any outdoor event, especially on cool Chicago nights. Climate control is a must for guest comfort. In addition to heaters, rent a heated tent with a climate control thermostat. The thermostat keeps the tent (and guests) at a comfortable temperature. Crowded tents also tent to be incredibly hot. If planning an event where a crowd is expected, consider adding fans to the event rental list. Free-standing or mounted fans can properly circulate air, which ensures that guests stay longer and enjoy the comfortable atmosphere. Today, event organizers have more options for sidewalls than ever before. Tent sidewalls may be essential for keeping a heated tent comfortable, but they can also be a detail that contributes to the overall event atmosphere. Clear and windowed sidewalls can give an event an indoor-outdoor feel, even when the temps are cool. The type of sidewall can also give the event a casual or formal feel. To determine the best sidewalls for the event, ask the professionals to recommend the best sidewalls appropriate for the occasion. Planning an outdoor wedding is all about creating the perfect wedding atmosphere with the right tent, décor, food, and lighting. The latter detail may be often overlooked, but wedding lighting plays a vital role in creating a stunning wedding atmosphere. Nothing says elegance like a chandelier. This lighting adds add a sophistication to an outdoor wedding; guests will be in awe of the beautiful chandeliers and elegant décor. Make your guests feel like stars at your outdoor wedding. Ask about up lighting that can reflect off the tent and create a bright and dramatic flare to a tent wedding. An extra special element of décor deserves to be in the spotlight, and pin spots are a great way to highlight them. Consider pin spot lights to help guests focus on food stations, centerpieces, and other beautiful wedding details. Nothing creates a night under the stars effect to a tent wedding like string lights. String lights can be used to add a touch of elegance to a formal rustic wedding or a romantic flair to a beautiful outdoor wedding. This casual tent lighting option is perfect for an informal affair. Globe lights are simple lights, adding a relaxed mood to a laid-back tent atmosphere. Crisp white glow. Colorful and festive. Unique and whimsical. Paper lanterns can be described by all these terms; discuss how paper lanterns can be customized for a crisp white glow or a colorful and lively look. To add interest to an outdoor wedding, add projection lights to the list of wedding details. These lights can be customized to project a relevant object or pattern onto the tent ceiling, such as snowflakes or the couple’s initials. Projection lights can also be a fun addition to any wedding photograph. Lamp posts are a one-of-a-kind lighting addition to an outdoor wedding. These posts can be scattered for a touch of atmosphere (such as on a deck or patio) or grouped for a unique entrance. You chose your outdoor wedding venue for a reason; highlight those extraordinary details with landscape lighting. This wedding lighting can also be useful for accenting natural décor inside the tent. Colorful mood lighting can add drama to any wedding tent, drawing guests in and creating an enveloping atmosphere. Discuss your options for mood lighting with an event specialist who can recommend the right color and lighting that fits with a stunning outdoor wedding atmosphere. A wedding tent is the perfect plan B (and plan A) that gives guests refuge from the unpredictable Chicagoland weather. It can also provide an intimate party, separate different wedding areas (i.e. ceremony area, dinner, dance floor, bar, etc. ), and create an unforgettable wedding atmosphere. Modern tents come in styles that can fit your guest list and your unique style (contact a pro to choose the right tent for your special day). For interior wedding tent decor, use these unforgettable wedding tent ideas to create your own special day. A tented wedding wouldn’t be complete without an entrance. A marquee entrance does just that, making a fantastic first impression on wedding guests. Give your guests a hint of interest against a neutral background. For a seasonal feel, choose a splash of color that signifies the season. Nothing brings the outdoor inside like beautiful floral (or greenery) arrangements. They can also bring height to a space or add romance to an elegant wedding reception. The effect of up lighting is magnified in an intimate tented setting. Lighting can add drama and set the stage for a wonderful evening reception. A one-of-a-kind tent wedding is a combination of all those unique touches that make it different (and festive!). A dance floor is a stage; make sure your stage is a beautiful setting for memorable moments and for busting a move. A proper stage floor can also have a practical purpose, especially when guests aren’t getting their heel stuck in the turf (or sand!). Clear tents are more than just a trend; they are an excellent way to make guests feel the beauty of your outdoor wedding venue. For a more natural flair, bring elements of the outdoors in and coordinate with natural wedding tent décor. The beauty of this design is that décor doesn’t always need to match, just coordinate for a natural and well-designed wedding style. Stylish lighting can add ambience to an elegant wedding and beautiful low-light to a wedding reception. A wedding venue with a beautiful view is a horrible thing to waste, which is why clear sidewalls can be a godsend. Not only can guests enjoy the view, these panels can keep away those pesky insects that can put a damper on a big day.